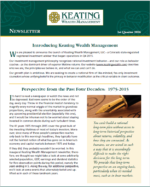 We have now published the inaugural edition of the Keating Wealth Management newsletter. As we did for nearly 15 years at Keating Investments, we intend to provide insights, commentary and perspective on the capital markets. One of the themes that we will be constantly reinforcing is the importance of having appropriately long-term horizons as the prism through which economic and financial market-related events should be viewed, contextualized and understood. The equity market volatility of the first week of 2016 should be viewed as nothing but inconsequential noise to an investor with a multi-decade time horizon. In the Q1 newsletter, we take a look (literally, with graphics) at some arbitrarily selected population, GDP, earnings and dividend statistics for five observation points during the past four decades (1975-2015), namely the years ending in 5. Along the way, for additional perspective, we highlighted some events that alternately befell and uplifted us in each of these landmark years. We think you might be surprised. It’s hard to read a newspaper or watch the news and not be depressed. Bad news seems to be the order of the day, every day. Throw in the financial media’s tendency to magnify every normal wiggle of the market to grandiose proportions along with the uncertainty associated with any upcoming presidential election (especially this one), and it would be inhuman not to be worried about staying invested in common stocks during such turbulent times. The 41 years 1975 through 2015 cover the great bulk of the investing lifetimes of most of today’s investors. Moreover, since many of these people’s perspective reaches only back to this morning’s headlines, they typically have not the faintest notion of what has gone on in America’s economy and capital markets between 1975 and today. Global population up nearly 80%, with extreme poverty slashed from one human in two to one in 10, creating wave upon wave of new middle class consumers. U.S. population up by half, and gaining a new person (through net births and migration) every 14 seconds. And still almost unimaginable room to grow: population density per square mile in this country is 85, compared with almost 300 in France, 590 in Germany, 680 in the UK…and 870 in Japan. Staggering natural resources, with mineral rights vested in the landowner. A hundred years’ worth of hydrocarbon energy reserves. Real GDP more than tripled, on only a 50% population increase—meaning real GDP per capita has soared. The S&P 500 rose more than 20x, on an earnings increase in excess of 15x and a dividend boost approaching 12x. Far more significantly, these gains must be measured against an increase in the general level of consumer prices scarcely more than 4.5x. Surely this is the greatest accretion of real wealth by the greatest number of people in the history of the world. What are the megatrends underpinning this spectacular economic and financial progress? Well, there are two, and of course they form a virtuous cycle. They are the spread of the free market, as liberty vanquished communism and most extreme iterations of socialism during this period, and exponential progress in information technology. (Today, a middle school child carries in his backpack a smartphone with more computing power than the state-of-the-art mainframe had in 1975.) This cycle continues apace. Source: All population, GDP, S&P 500 price, earnings and dividend statistics are sourced from the December 2015 edition of Nick Murray Interactive. Permission to use the data and the associated commentary from Mr. Murray’s article granted by the author to subscribers of his newsletter.